Click here to read what orchestral director and conductor, Allan Segal (misspelled above), had to say about this website. Paint Your Wagon is a story about the discovery of gold by Jennifer (Barbara Traynor), the 16-year old, uneducated daughter of Ben Rumson (Alan Lupi) while running her hands through the dirt in the Californian Hills of 1853. News travels fast and prospectors from all around rush to Rumson Creek to make their fortune. As the only woman around, Jennifer has to deal with many lonely and frustrated gold miners, but eventually strikes up a close friendship with a Mexican called Julio (Allan Malamy, '59). Ben realizes that Jennifer is not such a "little girl" anymore and decides it is time for her to leave on the next eastbound coach to be educated. Jacob (Jay Plotkin, '61), a middle-aged Mormon, arrives at Rumson Creek and is only allowed to stay on the condition that he auctions one of his two wives. After some deliberation he agrees, and one of the wives, Elizabeth (Carol Spadanuta, '59), is sold to Ben, much to Jennifer's disgust, and she packs her bags and runs to Julio's cabin in the mountains. Jennifer eventually decides to go east to school and to return when Julio has made his fortune. 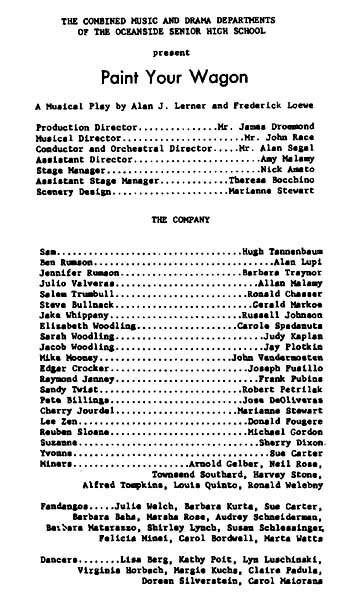 Jake (Russell Johnson, '59), a miner in his 30s, makes some money, builds a music hall and consequently sends for his wife, Cherry (Marianne Stewart, '59). With her she brings a wagonload of fandango dancers ― much to the prospectors’ delight! Soon the gold begins to run out, and the men pack up slowly and leave. Jennifer returns, unexpectedly, intending to marry Julio, but she later learns that he has left for the mountains in search of gold. (She is now very noticeably a more mature young lady!) News that gold has been struck forty miles away heralds a new gold rush, although Ben decides he cannot leave Rumson Creek. The story ends when Julio returns, by chance, and Jennifer runs into his arms! The most memorable songs in the show are "I Talk To the Trees" and "They Call the Wind Maria." Copyright © 2000-2005 by Howard B. Levy and 1960 Sailors Association Inc. All rights reserved.